Course details are basic. Styling won’t please all. ACR, AHA; 30,000 CP; golf history records the date, course and score for every round; swing tempo measurement; shot distance measurement; fitness features. 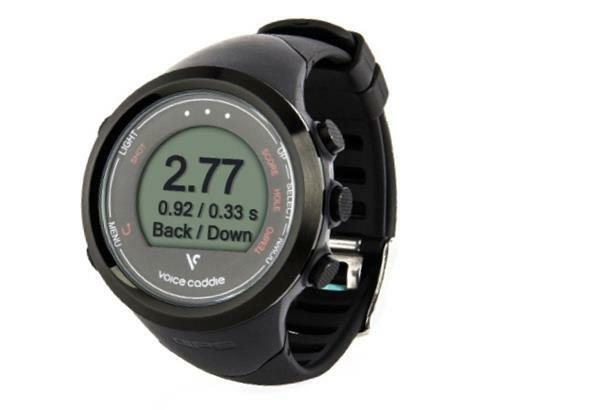 As reviewed in our 2014 Distance Devices Test: The name ‘Voice Caddie’ is misleading as it doesn’t offer a voice feature. The Swing tempo feature is unique, offering a backswing to downswing ratio – good info, but only if you know how to use it. It would help if the instructions provided a guide on what a good tempo reading is for different clubs. The Tempo trainer is a useful tool. Course info was lacking. It’s perhaps a little wide. The metal trim offers a blingy look. The functions, though limited, are easily labelled, but it is a bit disconcerting not to be able to turn it off.